Sam Rayburn High art students have a knack for producing award-winning show pieces, and this time their talents landed them in the top spots at the Fort Worth Stock Show and Rodeo Art Contest. 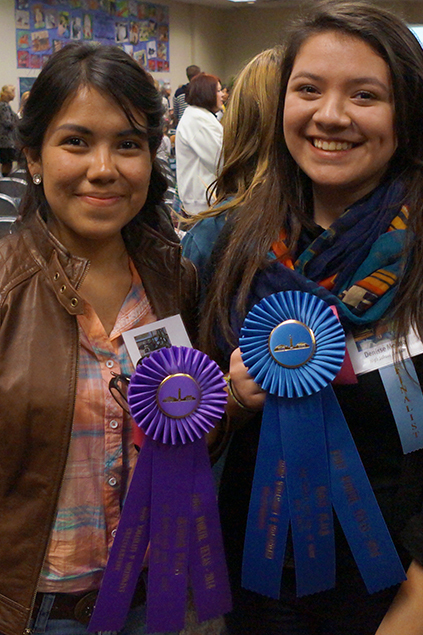 Rayburn’s Tania Lara and Denisse Molina competed earlier this week against over 280 students throughout the state in the Fort Worth Stock Show and Rodeo Art Contest. Both students landed as top ten finalists. Lara earned a seventh place spot for her piece, while Molina walked away with a first place ribbon and a $2,000 scholarship for college. Molina’s work will be auctioned off to the highest bidder later this month which will earn her additional scholarship monies. The art work will be on display throughout the duration of the Fort Worth Rodeo which runs January 17 through February 8. For more information including a schedule of events and art display locations, visit www.fwssr.com.